A grandfather with heart disease. A parent with high blood pressure. A sibling with diabetes. You probably know the details of your close family members’ medical challenges. Do you know who else needs that information? Your primary care provider. Providers want to know as much as they can about your health and experiences. Having details about your family’s medical history is valuable as they work to provide the best care possible. With that in mind, here’s what you should know. What is a family medical history and why is it important? Your family medical history is a record of all the medical conditions affecting your family members. You share a common genetic background and often common lifestyles and living environments. All of these factors can contribute to developing medical conditions, and your provider is trained to look for these kinds of patterns. What should your family medical history include? A family medical history should have information from as many generations of family members as possible. A good rule of thumb is to try to obtain a three-generation history. Your first-generation relatives are your parents, siblings and children. Second-generation family members are grandparents, aunts, uncles, nieces, nephews and grandchildren. Your third-generation relatives are your first cousins. 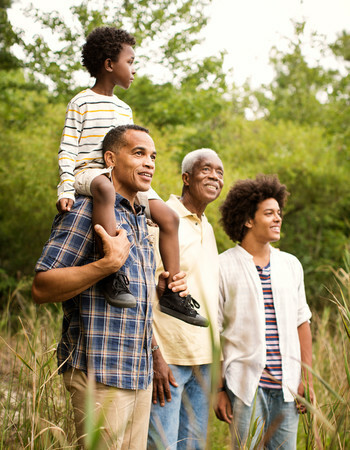 Pay special attention to conditions that develop early in life or health problems shared by family members across generations. Here’s an example of a family medical history form to get you started. How do you gather your family’s medical history? The best way to begin is by asking relatives about their health and medical conditions. I know – it may seem like an unusual topic. You’re more likely to stimulate discussion if you effectively explain why you’re asking and how it can benefit the whole family. As family members become comfortable discussing their health, move on to asking about relatives you can’t contact. Be patient. You may not get all the answers right away, but you’ll be planting the seed for the need to discuss this important topic. And it beats talking about politics! Remember to keep your records updated as time goes by. And if you’re the family genealogy buff, be sure to share what you know. If you’re adopted, your task may become more challenging. Your adoptive parents may have health or contact information for your biological family. An adoption agency might also have medical data or be able to connect you with biological family members. What if you can’t find all the information? Compiling three generations of information is a tall order. Don’t worry if you’re unable to get it all. Any relevant information is helpful for your provider. This is only one of many resources used to create an effective care plan. If you need further guidance on gathering your family medical history, contact your Methodist Physicians Clinic primary care provider. Dr. Brian Gartrell always knew he wanted to serve others. During the time he spent with physicians in his hometown of Columbus, Nebraska, it became increasingly clear to him that medicine was where he belonged. Board-certified in family medicine and otolaryngology, he has interests in several ENT-related issues such as hearing loss, nasal congestion and skin lesions. Dr. Brian Gartrell is a family medicine doctor at Methodist Physicians Clinic Risen Son.